Baby Toolkit: Have you heard? ListenAlongStoryBook.com podcasts popular picturebooks for free! Have you heard? ListenAlongStoryBook.com podcasts popular picturebooks for free! In the 70s, my favorite rack in the public library held plastic bags with books and records. Over my childhood Arnold Lobel's Stone Soup evolved into Sterling North's Rascal while the records were gradually usurped by cassette tapes. Today, the mention of those authors' names conjure memories of laying on the green shag carpet in front of the stereo and engaging in those well-told tales. Following the Raptor's toddling path through the library last week, I found that the library still has a small collection of those books on cassette (and now CD), but I suspect that those kids' audiobook are becoming a less common feature in libraries today. The audio mediums are more prone to breakage than print materials, so the collections require more patron care and general maintenance. One children's publisher (Sterling Children's Books) is making it possible for excellent dramatic performance to be a childhood standard yet again. On March 1st, Sterling launched ListenAlongStoryBook.com which offers live streaming and podcasts of their most popular picture books. Sterling's publicist sent us a copy of Cesar Takes a Break by Susan Collins Thoms (MRSP: $14.95), so 4 year old Ranger could experience the podcast with the book. Cesar Takes a Break is a very timely choice for kids about to take a Spring Break. Cesar, a classroom iguana, decides to explore the school when the children of the class leave for vacation. Ranger is in his second year of preschool, but every break seems to surprise him. This story seems a good way to make him mindful of the upcoming week's opportunities. Jim thinks the book's varied characters (the school's other class pets) lend themselves to expressive reading. Ranger loves it when Jim reads this story as well. The high quality podcast entails excellent and expressive readings (by Sterling Children's Book staffers) and original music. Ranger loved the Cesar Takes a Break podcast with and without the book. His reading skills at 4.5 leave him a bit baffled about when to the turn the page. The story pleases him even without the book in hand. We would love to see a subtle signal added to cue page turns as it would allow pre-readers to follow along with greater independence. Listen-Along Storybook's first 8 podcasts include the classic folktale Jack & the Beanstalk and new releases like Perfectly Arugula. Ranger and I will get the books from the library so we can follow along with the vibrant illustrations, but YOU have a chance to win the 8 book set from Sterling Children's Books. Sterling Children's Books has offered to give each of THREE lucky Baby Toolkit readers (in the U.S. or Canada) all 8 books currently featured on the podcast site. Sterling has also launched a Jokecast for the younger set. WARNING: These are serious groaners, and I know Ranger is going to love telling them to me HUNDREDS of times. ***Baby Toolkit is the brain dump of two Midwestern bibliophile geek parents with opinions on almost everything. 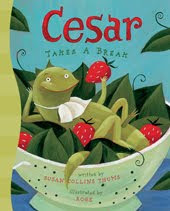 We received a free copy of Cesar Takes a Break from Sterling Children's Books (~$15 value). While free books are a decent route to our bookworm hearts, we wouldn't bother telling you (at least not in non-lambasting tones) about something we didn't like. Listen-Along Storybook contest ends tonight!